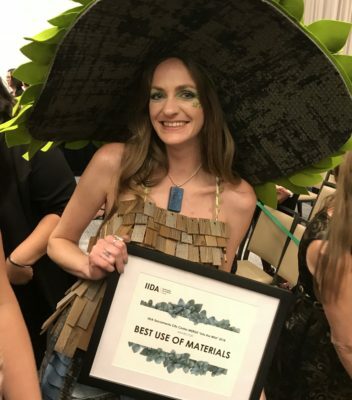 This year’s IIDA Merge event was better than ever, with an extended creation time, an elegant runway show location at the Kimpton Sawyer Hotel, and an exciting theme, “Into the Wild”! The teams were given a month to create their runway outfit, a change from prior years, where teams were given four hours on the day of the event. With so much time to create the fashions, extra care and creativity was placed into the design and construction, resulting in a dress that was unique, thoughtful and possibly even wearable. There are many reasons the W+P team participates in this event every year, including relationship building, showcasing our creative skills and most importantly, supporting the arts and education. The event began with a launch party, where each team randomly selected a theme and four manufacturers. A fifth manufacturer was selected for the team, as a “surprise” material. The interior design products were used in the creation of each team’s runway outfit. Our team selected the theme “Mangroves” and the wheels began spinning. THE TEAM. The team at W+P was comprised of three interior designers, two architects and a planner. Participation from different workgroups ensured several perspectives and a multitude of great ideas. The team worked well together, incorporating everyone’s ideas and setting the design direction early in the process. A month seemed like more than enough time to prepare and put together a fabulous runway outfit, but the team worked on the construction right up to the day of the event. OUR PARTNERS. Once the manufacturers were selected, the team met with them to determine which of their products were available for selection and appropriate for the intended use. All of the products used to create the outfits were those used in commercial interior design, such as flooring, wall coverings, solid surfacing and more. Although the manufacturers and products were ones the team often works with, the selection process was less about the products they frequently use and more about the material’s properties, such as color, pattern and stiffness. The team considered what would work best for the design theme and overall look. This allowed the team to become more familiar with products they may not frequently use in ways not previously thought possible. WITH THE COMMUNITY. Proceeds from the event go towards several design awards for local interior design students. As a company, W+P strongly supports causes related to arts and education, so an event like MERGE is directly in-Iine with our values as a firm. WITH OUR PARTNERS. The event furthers relationships with product vendors. The vendors donate products for use in the outfit. This year, our team won “Best Use of Materials”. The team was excited about the products they were given and found many new ways to manipulate them. Our MERGE team stepped away from this year’s event with a new excitement for the products we use on a daily basis. The event closed with a runway show in which each team provided their own model to showcase their outfit. The Kimpton Sawyer Hotel was a perfect place for an event such as this. With valet parking, excellent hotel staff and a beautiful patio bar overlooking the Golden One Center, the evening felt a bit like a weekend getaway, rather than an evening in town. Design companies from around Sacramento mixed and mingled over cocktails and hors d’oeuvres, while backstage the teams placed the final touches on their models and outfits. Students from Paul Mitchell were on hand to provide hair and make-up services for those who chose to use them. The runway show did not disappoint. 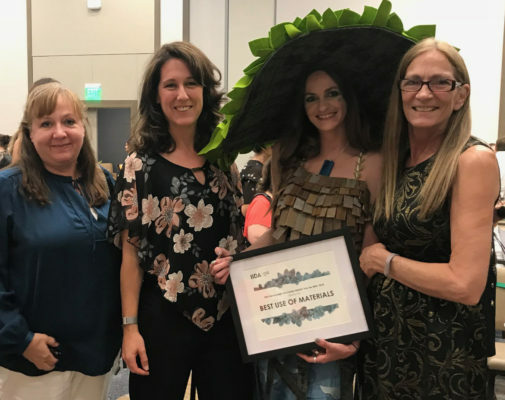 This year’s “Into the Wild” themes were Fresh Water, Evergreen Forest, Savannah, Canyon Land, Urban, Tropical Forest, Polar Desert, Swamp, Arid Desert, Coral Reef, Arctic Tundra and Mangroves. The creations chosen to represent these were bold, fierce and edgy. The model’s looks varied from floral, to tribal, to icy and hard. Our team created a garment to mimic the Mangrove tree form. They used J&J Carpet, 3-Form felt and Koroseal wallcovering for the canopy hat. Stikwood was cut into small pieces and layered into a bodice. The skirt was made with two colors of Koroseal wallcovering to evoke water and the outer layer was made from strips of J&J Carpet tile to represent the Mangroves’ distinctive root structure. A translucent blue Avonite was used as a necklace. In the end, an award for “Best Use of Materials” was an honor to us. W + P strives to think outside of the box, not just for events such as MERGE, but also in all of our designs. The MERGE event provides the perfect opportunity to use that creativity in support of local design students. Count us in for next year’s MERGE event!